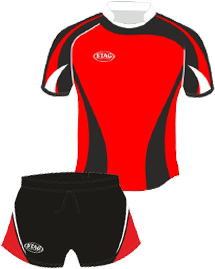 Take a look at our kit designs, these can be in any colour and can be amended to suit you. Alternatively, we are more than happy to draw up any design you have in mind. Before production of your kit start we will provide you with a graphic proof to ensure you and your sponsor is happy with the chosen kit. Our rugby shirts are designed and made in our West Yorkshire factory. We use the latest software and digital dye sublimation technology to provide great looking kit. Any our kit designs can be made in any of these styles. At Stag Sports we pride ourselves on our flexibility and customer care, no order is too small. We're here to help and are always happy to offer advice.